We've seen portable printers and mobile scanners before, but according to HP, the Officejet 150 Mobile All-in-One is the world's first portable all-in-one device, enabling you to print, scan and photocopy on the move. The HP Officejet 150 Mobile can be powered from the mains electricity or by using a supplied rechargeable lithium-ion battery that's good for around 500 prints. It connects to your Mac or PC over USB or Bluetooth, but if you opt for the wireless protocol, you can only print - scanning is only possible on a USB connection. There's no support for Wi-Fi or Ethernet networking, so don't expect features that rely on a network or internet connection such as Google Cloud Print or AirPrint. The paper feeder - which doubles as the lid when the printer's not in use - can hold up to 50 sheets, but you have to feed your pages one at a time into the scanner. Because it's a sheet-feed rather than flatbed scanner, it's not much use for scanning books or magazines unless you're prepared to destroy the original. The HP Officejet 150 Mobile is portable enough to slip into your suitcase for that business conference or research field trip, but since it measures 35 x 17.1 x 9cm (13.98 x 6.95 x 3.52 inches) and weighs 3.1kg/6.8lbs with the optional battery fitted, it's too big and heavy to casually slip into your briefcase or notebook bag. It's not to be taken lightly as a financial investment either. 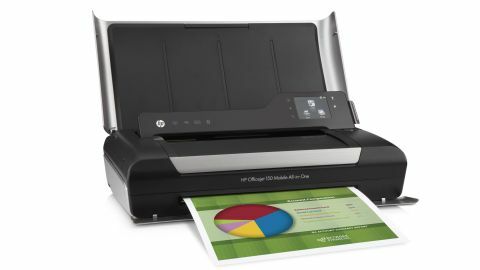 With a full price of £269/US$399.99/AU$449 it's considerably more expensive than most multi-function inkjet printers. A standard black ink cartridge costs £20.99/US$25.99/AU$31 and the tri-colour cartridge is £22.99/US$31.99/AU$40.99. The black cartridge lasts for approximately 423 prints and the colour for 330 prints, giving an ink cost per page of 5p and 7p respectively, in the UK. Again, this is more than you'd pay for a regular inkjet multi-function printer.